Have you ever been so excited about your latest project that you just wanted to scream about it from the rooftops? Well, consider broadcast emails your business’s megaphone. Broadcasts are perfect for delivering your company’s news, whether you’re announcing a new product, promoting a limited-time sale, or keeping readers in-the-know with your latest email newsletter. That’s the big difference between broadcast and follow up emails. A follow up email series contains evergreen content that you send to people at any time of the year, but broadcasts are for time-sensitive information that you want to get out the door today. The content possibilities for broadcast emails are nearly endless, but we’ve narrowed down three types of emails along with some useful tips for writing each. Many businesses send weekly, bi-weekly or monthly newsletters to their subscribers to update them on company-wide news and events. These are among the most commonly used broadcasts, probably because they’re so versatile. Sometimes it’s tough to come up with new content for your subscribers on a regular basis, so here are a few ideas for your upcoming email newsletters. Is your business active in the local community? Give your readers a glimpse into your company’s latest community outreach to help humanize your brand. Have a rockstar customer? Show them off in a short case study that explains how they use your service or product to help solve their biggest challenges. This is an opportunity to show your team’s passion for what you do. Why did you start your business? What makes your team special? Putting a face (or faces) to your brand can help create a deeper connection with your customers. You’re already tuned into your industry, so why not give your readers a personalized news feed full of useful, relevant articles? Is there a way your customers can stretch their budget by using your services? Can your product help simplify their lives? Is there a way of using your product that your customers may not know about? Give your readers useful tips to keep them coming back for more. Use your newsletter to promote and remind your subscribers about upcoming special events, whether it’s an in-store only sale, an open mic night or a special menu at your restaurant. When it comes to the timing and frequency of your newsletter broadcasts, you should experiment with your own audience to find what works best for you. For example, if you’re a music venue with multiple events each week, it might make sense to send a weekly newsletter to your subscribers. Any time you launch something new or make updates to a product or service, it provides an opportunity for you to reach out to your subscribers. Create a release plan in the months leading up to your big announcement to get on your subscribers’ radar early. This will also help you put together the bigger picture of your release and identify other areas where you can promote it, like on social media and your blog. Your email’s message should create buzz. You’re excited about your new offerings, so you want your readers to get excited, too. What’s so great about it? What problems does it solve? How can people make a purchase? When is it available? If it’s an update, what kinds of improvements can people expect to see? You message should clearly communicate the value of your new products or services. If your product is visual (think clothing, crafts, etc. ), you can simply show it off in your email, like in the example below. As always, make your call to action prominent so your readers can easily find more information or purchase your latest offering. Create a sense of urgency in your emails, and you could see a surge in open and click-through rates. Sales and promotions with an expiration date are perfect for this because they prompt your subscribers to open your email now. If you’re looking to get results fast, limited-time sales are the way to go. When it comes to promotions, timing is the name of the game. The message itself doesn’t have to be long – your subscribers should be able to scan your email and find what they need quickly. Nutrisystem does a good job of this in the example below. Broadcast emails are a great opportunity to connect with your customers by showing off your business’s latest offerings. Put some of these tips to work in your next broadcast and see what your audience responds to best. Want more tips on how to write compelling emails that influence readers to take action? 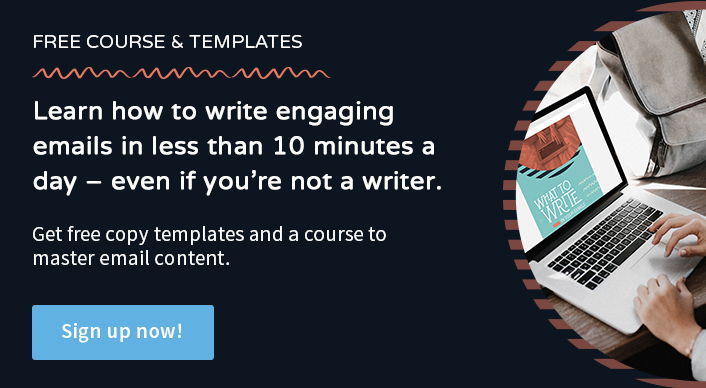 Sign up for our free, 6-day course, “What to Write in Your Emails” course. And as a free bonus, you’ll get 45+ copy template! When it comes to the timing and frequency of your newsletter broadcasts, you should experiment with your own audience to find what works best for you. Even talking about or linking to content that is loosely associated with the targets interests can be helpful. Some nice ideas I had never thought of Kristen. Hopefully I’ll be able to incorporate some in my next few newsletters. Especially like the Customer of the Month idea.